Looking for a live training experience? We offer collaborative learning from the experts to optimize your virtual classroom experience. Learn it Live training is available on a variety of solutions, including JD Edwards, Oracle Cloud Applications, and ReportsNow DAS. Live training webinars and workshops offer education and interaction in real-time. Our live sessions walk through essential concepts, terminology, and key processes, and we’ll leave you with the resources. Learn from live experts and practice your learning. Come with your questions and get the answers and clarifications you need. Live screens offer trainers the chance to demonstrate what you need to master. Share with a professional learning community to brainstorm, collaborate, or set mutual goals, all with guidance from the experts who remain available for questions post-training for continual learning support. Affordable training at your fingertips. We can teach in your environment with your data for an accurate training experience. We’ll also ensure any content or resources are delivered securely. We customize training to ensure it meets the unique needs of your audience by identifying competencies and gaps to ensure you get exactly what you need. We provide precise training from seasoned experts for your areas of business, from Finance to Manufacturing, Payroll to Capital Asset Management. We will leave you with any resources or documentation used during training. We can also track attendance and provide a recording of training for future use. Want a blended approach? Try our flipped classroom. Have users around the world? No problem. 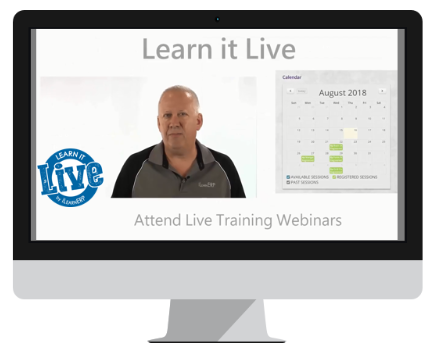 Learn it Live training ensures your users get a consistent training experience from the experts, no matter where they are located. We use modern web and video conferencing tools for a comprehensive experience, and we can provide training with multiple languages. What JD Edwards EnterpriseOne courses do we offer? Looking for our EOne Academy Learn it Live Webinars?